The inauguration was organised on the occasion of the 48th founding anniversary of the Association of Southeast Asian Nations (ASEAN) (August 8, 1967) and the 20th year of Vietnam’s ASEAN membership (July 28, 1995). 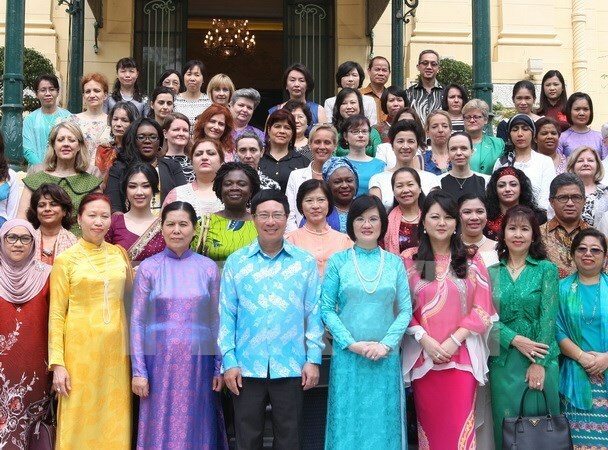 The AWCH bring together wives of diplomats of ASEAN nations along with female staff members of the Vietnamese Foreign Ministry and representative agencies of regional countries in Hanoi. Its honorary Chairwoman is Ambassador Nguyen Nguyet Nga, wife of Deputy Prime Minister and Foreign Minister Pham Binh Minh. She is also a member of the executive board of the Vietnam Women’s Union. The circle will act as a friendship and cooperation bridge linking Vietnamese women and their peers in ASEAN as well as between ASEAN with other countries around the world. Its operations will create opportunities for regional women to share information and experiences and promote gender equality and the role of female diplomats. Addressing the event, Deputy PM and Foreign Minister Pham Binh Minh said the launch was of critical importance given the theme of the ASEAN Chairmanship this year is “Our People, Our Community, Our Vision” with people in focus and women as an inseparable part of the ASEAN Community. Women have continually played a critical role in the bloc’s cooperation and are even more crucial to the establishment of the ASEAN Community and the implementation of the post-2015 ASEAN Vision and common goals, he noted. He expressed his hope that the AWCH would conduct diverse and practical activities to boost mutual support, understanding and friendship, contributing to the strength and solidarity of the ASEAN Community. On behalf of women in the region, Karen Low Zabidi – spouse of the Ambassador of Malaysia, Chair of ASEAN this year – valued the founding of the AWCH, adding that the circle’s activities will help enhance connectivity and assist the formation of an ASEAN Community based on solidarity, cooperation and development.